Celebrate the life of a loved one by making the most of our funeral reception services. A wake is a beautiful way of offering hospitality and warmth to your family and friends who have gathered to say goodbye to a loved one. Let us handle all the details, so that you can focus on what matters most. With our spacious car park and tailor-made packages, not to mention our close proximity to Barham Crematorium, we are the ideal choice to alleviate the stress of this distressing time. Please note: we do not accept cheques; all prices are per person; and there will be a £50 deposit upon booking, with any remaining balance to be paid on the day. Please be advised that the package price per head includes venue fee for use of the restaurant for 3 hours, unlimited tea and coffee, and staffing for your reception. 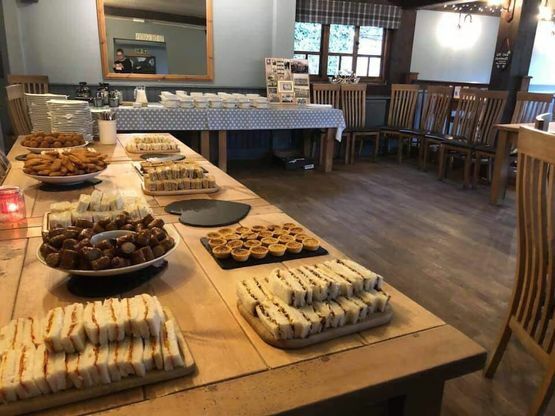 If more people arrive than previously expected, we are more than happy to provide additional sandwiches at £7 per board. For late afternoon wakes, the restaurant area must be vacated by 6:30 p.m., so that our evening service may commence. We are happy to cater for food intolerance's and allergies if advised in advance. Get in touch with us,to find out more about our funeral receptions.